Building design services stand in a very unique position in the building process of a new home. 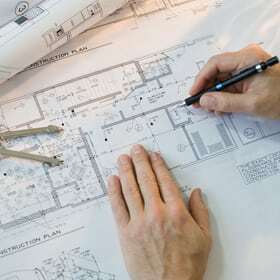 The building designer is the person who translates the desires, dreams, and wishes of the prospective home owner into concrete plans the builder can use for construction. 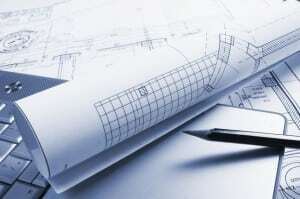 So who should the drafting service aim to serve? It would be easy to argue the building design services needs to focus on the needs of the builder. The plans need to be precise, clear, and error free to make sure the construction process is efficient and moves forward quickly. Simple mistakes in the material list, measurements, or construction details can lead to major mistakes, cost overruns, and delays. The builder’s interests are highly important. Many builders have their own home designer or draftsperson on staff. They do this to gain higher control over the entire project and to have the ability to make changes fast. Is this the best situation? The other perspective is the home owner is really in charge. After all, they are the one paying the bill. They are paying the designer, the builder, and for all the materials to make the project come together. The house will be their property for years, if not their entire lifetime. We all know the real answer is that ideally the building design services focuses first on the owner of the home, but it is not really a complete answer. At Drafting Concepts PTY Ltd, in Brisbane and Sunshine Coast Queensland, they believe the focus needs to be bi-directional. They need to stand in that central ground where they clearly see the vision of the buyer and then work diligently to translate it into plans which work for the builder. They cannot focus wholly on either side of the equation, or the home design will be flawed. This is just a start to the list of details which must be included specific to the builder. These added details are important to the buyer, but many of them you may not really care about. Do you, as the buyer, want to worry about all the local building regulations and requirements? You probably want to leave those details up to your designer and the construction team. As the buyer you are the central focus of the plans. You are the vision which is followed, but then once the vision is clearly understood the focus of the building designer must turn to the builder’s needs. He must create plans which take the plans from ideas and turn them into solid instructions for making the home construction a success. 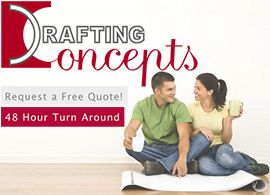 To get a clear understanding of how the entire process works Daryl Woods of Drafting Concepts would be happy to sit down with your for a free consultation. He will explain this design processes and ask you the tough questions to determine exactly what type of home you are interested in owning. You will quickly see the focus is centered on you, but with an eye always on the final target, creating plans the builder can use effectively.